Lirael by Australian Author Garth Nix is Book #2 in the Abhorsen Trilogy. I read Book #1 Sabriel last year and I loved it (although I forgot to write a review). Lirael is a fourteen year old Daughter of the Clayr. Her pale skin and dark hair mark her as different to the rest of the Clayr, but it is her lack of sight (seeing the future) which upsets her more. She keeps waiting, until she decides she can’t wait any longer. Her depressed thoughts almost see her end her own life, until a chance encounter with some of the Nine Day Watch instead sees her become a trainee Librarian. It is here Lirael begins to unravel the mysteries hidden underneath the Clayr’s Glacier, along with her own special abilities. Drawn into events outside the only home she’s ever known, Lirael will join with Prince Sameth to face an enemy long since buried in the past. The events in Lirael happen a long time after Sabriel has defeated Kerrigor and a new enemy to the Old Kingdom is arising. 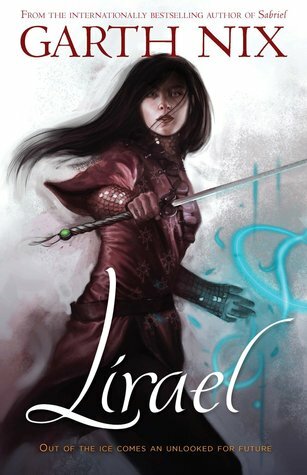 Lirael is a wonderful character with her insecurities but also her magic. The Disreputable Dog captured my heart, as most animals do, and it was fun to see Moggett again. I found Prince Sameth charming to begin with, then irritating once his foray into death scared him (although, to be fair to poor Sameth, I’d be scared too and I believe this was Garth Nix’s intention). I liked the way both Lirael and Sameth begin to learn who they really are and what it is they are destined for. Garth Nix has created a wonderful, magical world in the Old Kingdom. I really enjoy the references to the trenches beside the wall in Ancelstierre and the way the differences in technology and magic work on each side of the wall. Unlike Sabriel, which really does stand on it’s own, there is no true ending to Lirael. To find out if Lirael and Sameth are successful, you need to read the next book in the Trilogy — Abhorsen.